in the worst way. 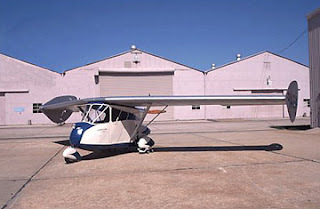 Inspired by what was apparently Curtis' casual remark about driving an airplane away from the field, Waterman spent years developing a roadable airplane. In 1934, he flew his first successful prototype, the "Arrowplane," a high-wing monoplane with tricycle wheels. On the ground, the wings folding against the fuselage like those of a fly (now would be a good time to note that Waterman must have been crazy to get airborne in such a contraption). Nonetheless, the Arrowplane goes down as the first real flying car. Two decades later, Waterman finally perfected, if that's the word, what he then called the Aerobile, configured as a swept-wing "pusher" (prop in the back). There were few customers with so consummate a death wish as to order their own Aerobile, and Waterman's one working car-plane eventually wound up in the Smithsonian, where it can't kill anyone.